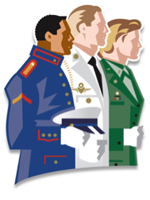 Promote yourself as a housing provider for veterans. It's as simple as checking a box - doing so will immediately flag your listings as properties where veterans are welcome and put your listings in easy view of organizations working to help veterans find housing. It's good for you - and good for the men and women who have served our country and now need a place to call home. Register today and check the "Veterans" box on your registration form or check the VASH box on individual property listings. 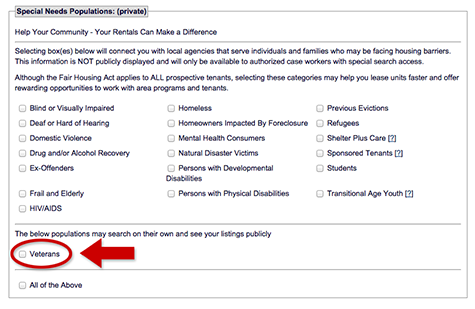 Login and select the "My User Info" tab, scroll down to "Special Needs Populations and Agencies" and click "Edit." Check the "Veterans" box.